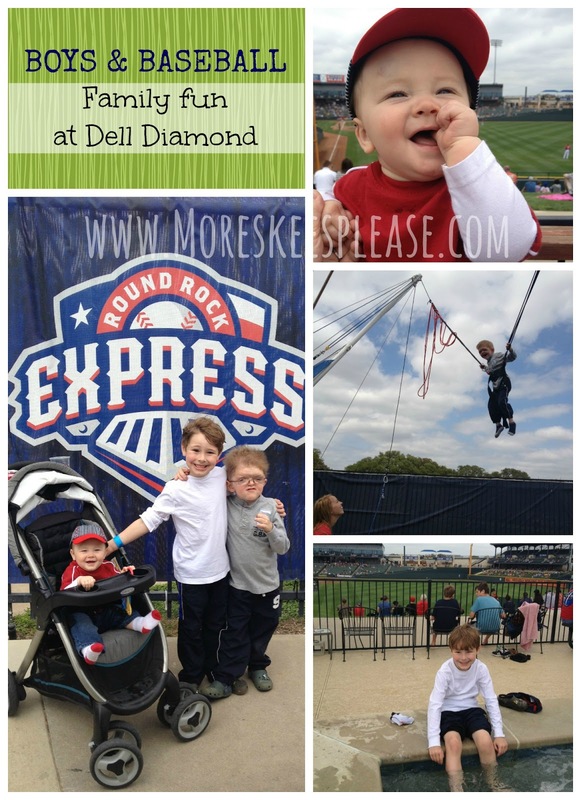 A few weeks ago our family was invited to spend the day at a Round Rock Express game. We were treated to the best party experience you can get at the Dell Diamond, enjoying food and beverages all while lounging around the private pool located on the upper deck. It was Hudson's first sports outing (besides the boys t-ball of course) and he was excitedly taking it all in. The big boys - Ethan and Aiden - were less interested in watching the game, and more interested in climbing on the massive play structure, scaling the rock wall and bouncing into the sky on the bungee trampolines. There is definitely something for everyone there! Although it was supposed to be cloudy and cool that afternoon, the clouds parted and it warmed up quite nicely. This was both good and bad. Good, obviously, because we were able to soak up the sun and not freeze our tushies off. Bad, because I decided last minute that it would not be a good idea to bring our swimsuits...and when the boys saw other families getting in the pool and hot tub, let's just say it took all the restraint they had not to jump in with their clothes on. Aside from a few uncalled for remarks from some insensitive kiddos (something we deal with pretty often, unfortunately), the outing was an extremely enjoyable one for our family. If I could afford to host my own party in the pool area, I'd definitely consider it. Lucky for me they do have some very reasonable Birthday Bash packages outside the pool area that incorporate some awesome things for kiddos. Click here to learn more about how you can host a party at the Round Rock Express games!